The workhorse Brush Type 2s were introduced in 1957 and there are scenes of them at work at many locations across the network including Harringay, Hadley Wood, Cambridge (on the Royal Train), Paddington, Wennington, Instow on the Bideford branch and on the last train along the Dunstable branch ("The Skimpot Flyer"). 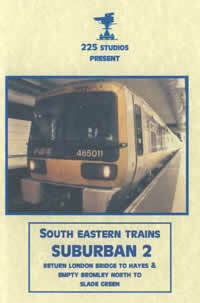 The numerous BR Sulzer Type 2s operated throughout the UK. We see them as far afield as on Tyne Dock Iron Ore trains, the Tay Bridge, Kyle of Lochalsh, Thurso, Ais Gill, Manchester, North Wales and Dawlish. 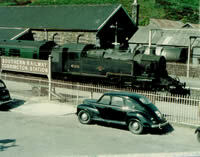 We also see them on the Cambrian at Llynclyss, on milk Trains at Torrington, china clay trains around Bodmin, and at Bredbury Junction being banked by a Stanier 8F. 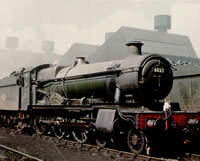 Even a pair triple heading with a BRCW Type 2 on the "Royal Highlander"! Finally, there are scenes of BRCW Type 2s working commuter trains at Luton before we head north to see them in later life working on the Kyle of Lochalsh line. 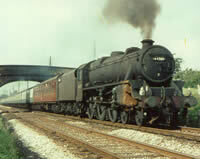 There is also rare footage of D6547 hauling Schools Class "Repton" and M7 30053 en route to Canada. 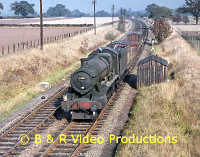 Plus footage of piloting Bulleid Pacifics up the ferocious Bincombe Bank, and around Shrewsbury during Crewe Station refurbishment.